And she explained that taking care of the leaves was hard work for the tree and that, after keeping them all summer, it needed to rest for a while. I love the deep truths that you can find stated so simply and clearly in children’s books. It’s the type of wisdom that sticks with you into adulthood. The above passage comes from a book called Leaf Trouble by Jonathan Emmett. 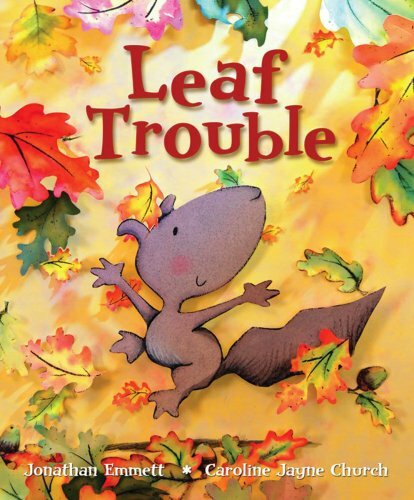 It’s the story of two squirrels named Pip and Blossom that discover the leaves of their tree are falling. And they are so concerned that they attempt to gather the leaves and place them back onto the tree. That is, until Mom comes by to explain about the necessity of autumn and how change is a part of life. One of the great things about living in this part of the country is that the seasons are distinct. The passage of time is marked by the way nature is continually changing around us. I enjoy seeing the rhythm of the creation. The way we are constantly moving from life and energy to death and dormancy. But that’s not to say that I enjoy everything about each season. I love spring. I love the new life that is popping up everywhere (even if my allergies don’t), the energy in the air and the sense of hope that comes when the long winter is subsiding. And fall can be great, too – the crispness of the air, the sound of football and marching bands, the beautiful colors. But there is something foreboding in fall. You can see it in the way the trees begin shedding their leaves. Winter is coming. And that means cold and darkness. It means death and hibernation. Fall means change is coming. I’m not always good with change. And neither are you. When faced with change – whether because of my own doing or if change is thrust upon me – I often feel like Pip. Instead of looking at the big picture, I lament because I don’t want to change. I worry about the impact it will have. And I may even run around like Pip in a desperate attempt to fuse the leaves back onto the tree. To stop progress and stay where I am. But change is a part of life. We get no rebirth without death. After hearing Mom’s wisdom, Pip and Blossom no longer spend their energy wishing things would stay as they are. Instead they see the beauty in the colors of fall and dance around in the falling leaves. So this is my prayer for you today. May the reds and golds and oranges of the fall trees remind you that change is just part of the cycle of creation. May you lay down the anxiety that comes with the changing seasons of your life and look forward to the rebirth that follows. May you stop attempting to reconstruct the trees and boldly dance in the falling leaves. Because change is a part of the creation God created. And even after death, life can be found.